SCN Asia: What is your job description and where are you based? Andrew Nicol: I’m based in Australia and am leader of Arup Acoustics in Australasia, a territory that includes Singapore. I also have another role which is leader of Arup Venue Design in the region. The difference between the two is that acoustics is the traditional practice we’ve had for 30 years, whereas venue design is a new thing we’ve invested in during the last two or three years. It’s a different way of describing theatre consultancy, which is a discipline that acousticians often work alongside. But we’ve taken it a step further because not only are we doing lighting, sound, and AV, we are also looking into sustainability, planning, logistics, and so on. If you want to work out how to get 50 trucks’ worth of equipment into a venue that’s floating 20 storeys into the air— well, we can help. 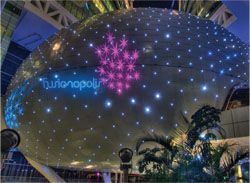 Singapore’s Fusionopolis theatre, which opened its doors this month, is suspended between three office towers and can be seen from many miles away. the architect Zaha Hadid for a large parcel of land that includes industrial projects, warehouses, and offices. One of the components of this is Fusionopolis, which went to an international design competition won by the Japanese architect Kisho Kurokawa (who sadly died last year). Kurokawa conceived the idea of three 24-storey tower buildings that would have a central area suspended between them. This central area is the theatre, which starts at the fifth level and goes up to the eighth. The idea is that the towers will become a home for a lot of media, science and research companies and, symbolically, the theatre acts as a ‘brain’ into which neural thoughts are channelled from the towers, and where the ideas of all their occupants are populated. We were to create a space which, every time you went into it, it always appeared different. It also had to be highly flexible—capable of hosting everything from an AV conference or production launch to traditional end-on theatre to experimental performances. It’s a single auditorium with a capacity of 450 people, so it’s quite small. But bars are important social places in Singapore, and we have a funky lobby design to attract people. From there, you go up through a glass escalator into this space which breaks all the rules in terms of good audio because it curves all over the place. What we created was a very transparent, open form, essentially a structure within the space. Wherever you are, you can always see the outside walls of the ‘brain’. SCN Asia: You’ve also been working on a major project in Melbourne, Australia. How does that differ from Fusionopolis? AN: This is the Melbourne Recital Centre— a project we started working on in 2001. From the outside, the inspiration for the MRC was the polystyrene wrapping that typically protects a computer or a piece of consumer electronics, fused with a mixture of influences from around the world. Then you step through a funky foyer into this extremely calm space which is the auditorium, where almost everything is made from timber other than the fabric on the seats. The theme for that came from the back of a Stradivarius violin. The acoustical design of the room needed a diffusing surface, so we ended up designing a swirling pattern of rebated timber, which represents the grain of the back of the violin. SCN Asia: How does Asia-Pacific differ from the rest of the world in its approach to performance venues? AN: Asia is a fun place to work. Asian theatres are different. It’s all about bigscale production—big, wide stages, lots of color and so on. You need to understand that before you can design properly in this region. Also, theatres are much more gizmo-savvy—there’s a lot more technology going in. Fusionopolis is filled with WANs and LANs—around 50 internet connections so you can plug into the vision and the sound from almost anywhere. It’s a common theme right the way through Asia. You can’t escape it. SCN Asia: How would you sum up the theatres of the future, and their needs in terms of AV technology? AN: Traditional theatre is still strong, but in order to have a sustainable business, you have to put on more than theatrical productions or opera. There’s a broader market for rock gigs and larger-scale productions, and systems need to be able to accommodate that. Then there’s the issue of getting into the minds of the next generation of theatre-goers. They want to be network-enabled when they walk into a building, so that their iPhone can download stuff, their preferences come up when they book a ticket, and so on. It’s about the whole engagement with the cyber-world and we have to respond to that. Audiences are going to want to go to places that are much more funky and much more techno-savvy. It’s changing the way we have to design spaces.